"He did this in the name of ISIS, and along with the other items recovered at the scene was some notes that further indicate that," John Miller, deputy commissioner of intelligence and counterterrorism of the NYPD, said this morning on the attack that killed eight. "He appears to have followed almost exactly to a 'T' the instructions that ISIS has put out in its social media channels before with instructions to their followers on how to carry out such an attack." -- The sole suspect, identified as 29-year-old Sayfullo Saipov, was shot in the abdomen by a police officer and was transported to a hospital for treatment. -- Authorities are calling the incident a suspected terror attack. -- Investigators have since been able to talk to Saipov, who is expected to survive. It’s unclear what, if anything, investigators learned from him, though one official told ABC News the suspect seemed “proud” of the attack. 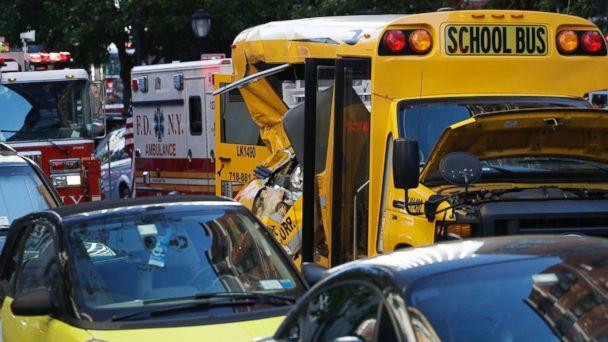 The suspect eventually crashed into a school bus near Chambers Street, just across from Stuyvesant High School.